Get rid of that trackpad, HP, and you'll have something executives might want to buy. HP’s Lap Dock represents a future where a smartphone is powerful enough to replace your computer. 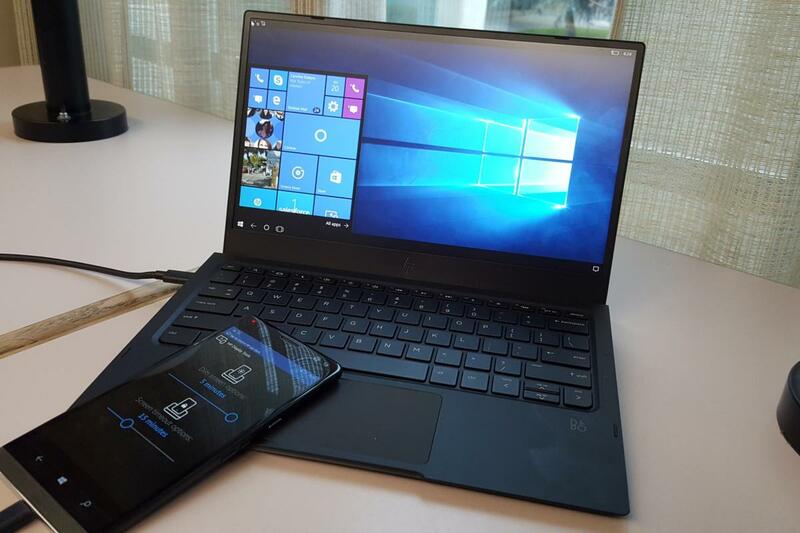 Arguably, the future may already be here: HP’s Elite x3 stands as the best Windows phone on the market, integrating a Continuum dock with cloud-based legacy Win32 apps for a PC-like work environment. 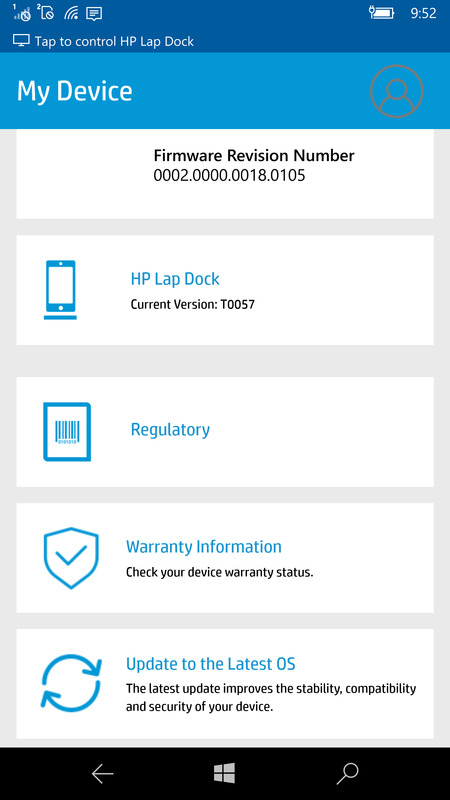 HP’s Lap Dock carries itself with the understated manner of the elite—which, as a $500 phone accessory, it really is. 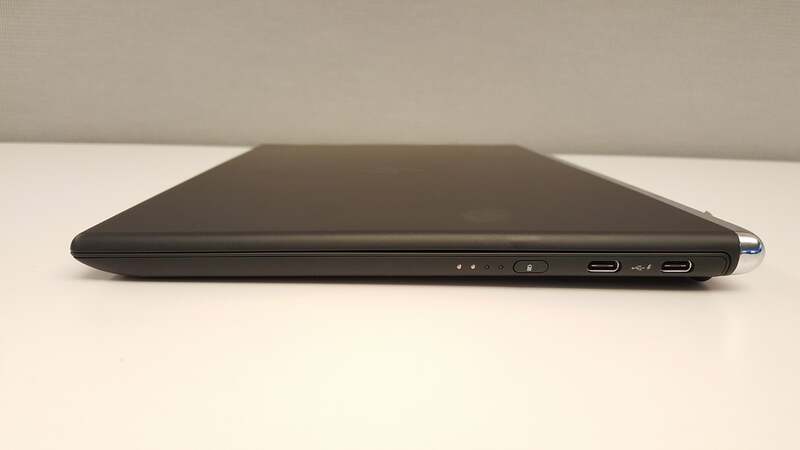 It’s a credit to ultrabook designers that, when closed, you’d be hard-pressed to tell that the $500 Lap Dock is not a thin-and-light laptop. 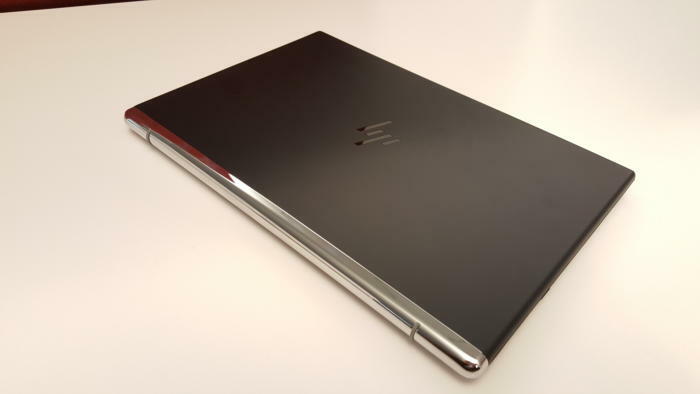 It measures 11.37 x 7.91 x 0.54 inches, it has a 12.5-inch, 1920x1080 LED-lit (non-touch) display, and it weighs 2.3 pounds—you can thank the integrated 46.5Whr battery for that heft. Clad in reinforced black polycarbonate with a shiny aluminum hinge, the Lap Dock’s exterior conveys the sophistication of a premium, executive-class device. A mini-HDMI connector can link to an external display, and there’s even an LED battery gauge, which can visually convey how much juice is left in the tank. 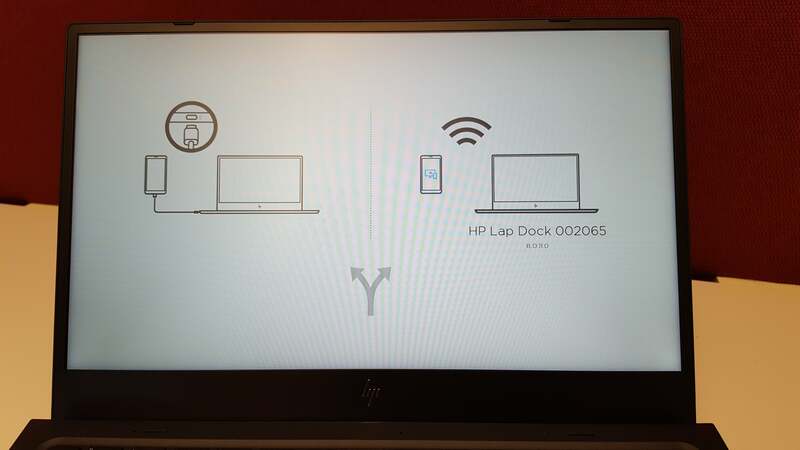 If you open the Lap Dock without connecting a phone, there’s a small boot sequence of a few seconds where the Dock shows you how to connect either wired or wirelessly. That screen disappears when you connect a phone. A brief schematic during the boot series reminds of you of your wired and wireless options to connect the Lap Dock. HP’s build quality generally carries over into using the Lap Dock as, well, a laptop, though some usability issues may raise your eyebrows. The backlit keyboard feels solid, though the keys could be a bit stiffer for my taste. But there are slight annoyances, such as the lack of a function-key lock, and the omission of on-screen brightness controls, that remind you that the phone's in control. The only indicator of screen brightness is...the screen’s brightness, which scales up to a decent 268 nits by my measurement. You can control the volume either with the phone or the Lap Dock’s controls, and an on-screen slider visually indicates the volume level. The Lap Dock’s Bang & Olufsen speakers are sufficiently loud. A first review unit I received had flaky audio playback, but a second Lap Dock with updated firmware had no such problems. Like HP’s other apps, the Device Hub is a nice central point for managing your devices. Tapping the Lap Dock card checks to see if the Dock’s firmware is up to date. HP has bought into the modern USB-C connector wholesale, with one charging port, one input port (for the phone) and a third I/O port, all using USB-C. If you have an older USB-A peripheral, you’ll have to track down an adapter dongle. The Lap Dock’s charging behavior is a bit odd, though. If you tap the “battery” button on the right edge of the Dock, the four-LED battery indicator lights to visually show you how much charge is left, in 25-percent increments. A small, almost indiscernible LED next to the Enter key also flashes red to indicate that the Dock is totally out of power. That makes sense. Maybe this is an example of HP’s over-engineering, but I found the whole thing unintuitive enough that I had to consult the manual to find out what was going on. Why not simply light one of the battery gauge’s LEDs green when the device is fully charged, and red when it’s empty? This is a nice touch: the four LED lights (two of which are lit, here) visually indicate the onboard battery status. To light them, you’ll need to tap the battery key to the right. Where does the phone go? A slightly more serious issue is simply what to do with the phone. You can connect a Windows phone to the Lap Dock either via the USB-C cord or wirelessly, though a wired connection is a far superior experience. But what do you do with the phone when the Lap Dock is in your lap? You’d best hope that there’s a flat surface nearby, or that you can slip the phone in your pocket—and that you don’t trigger something accidentally. The Lap Dock also lacks a camera, so you’ll need to awkwardly prop up or simply hold the phone for Skype calls. HP’s own wrappers advise you that your trackpad touch targets will be small. I’m not sure that they’re even that large. For me, however, the worst experience I had with the Lap Dock was using the trackpad—so, every few seconds, basically. I noticed a bit of lag when swiping right from the home screen, for example, to access the apps menu. The trackpad’s buttons were also a problem. 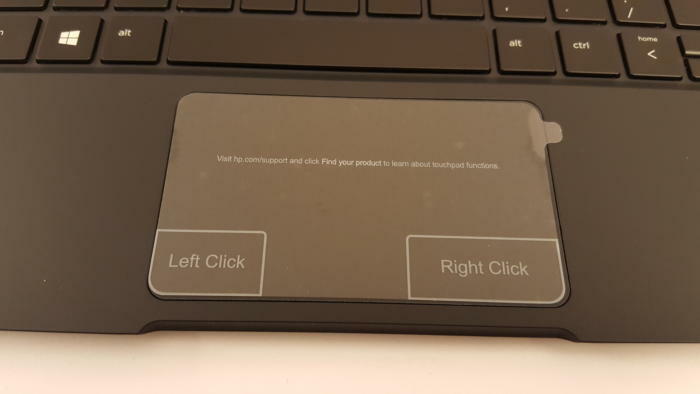 Integrated into the bottom of the trackpad, they registered only when I clicked the very lower edges, even on both of the Lap Docks I was sent for review. Note that I said “register”—on my machine, I could click midway down, but the only time the Lap Dock would actually process a click was at or very near the bottom of the trackpad. Talk about an exercise in frustration. The ability to connect the Lap Dock to the phone either wired or wirelessly also affects the battery life. HP’s battery test is similar to ours: looping a 4K video until the battery runs down. HP rates the Lap Dock's battery life at 7 hours, 10 minutes while connected via the cable, and about 6 hours when video is streamed wirelessly. Our measured battery life was somewhat less—6 hours exactly—primarily because HP tested at 150 nits of screen brightness, and we standardize our testing at what we consider to be optimal brightness—between 250 and 260 nits. Naturally, the Lap Dock will charge a connected phone via the USB-C cable—but the phone will also charge while the Lap Dock itself is running off its internal battery. Incidentally, when the Lap Dock’s battery expires, you’ll probably be left with a healthy charge on the phone. There’s quite a bit more that’s right about the Lap Dock than wrong. Aside from the truly annoying trackpad, most of my criticisms are merely nitpicks. A bigger issue, of course, is the viability of the Windows Mobile platform that the Lap Dock is predicated upon. Microsoft continues to support it, though the responsibility for driving it forward and developing hardware for it has fallen once again to the hardware makers. The message I take away from all of this, however, is twofold: One, HP believes some mobile platform will eventually offer the power and capabilities to drive a “desktop” environment, even if it’s not Microsoft; and two, users have become comfortable with the laptop form factor. HP’s done its homework, and if “dumb” laptops take off, HP will be ready to ride the wave.